Dr Shivani Sharma qualified from Birmingham Dental School. 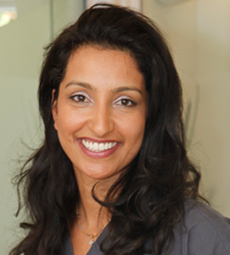 She has worked in various practices in London, where she has treated patients with a wide range of dental needs. She enjoys treating families and is always keen to promote oral health especially to children. Her gentle nature means that she has successfully treated very nervous patients and restored their confidence in dentistry. Like Rajan, Shivani is qualified to treat patients under intravenous sedation. Between having children Shivani has proved her determination in providing top class dental treatment, developing her skills in cosmetic dentistry by attending a variety of courses. Shivani likes to go scuba diving and has trekked through the jungles in Borneo. She has also jumped out of a plane at 10,000 feet! Nowadays, her other passion is to provide oral health education to local schools. I love my dentist Shivani. She’s kind and patient. When I was a bit worried she made me calm down and I’m not scared of dentists now.